Thanks for submitting your gift certificate request. Our team will validate your certificate and send you an e-mail confirmation. Be•spoke adjective: (of goods, especially clothing) made to order. 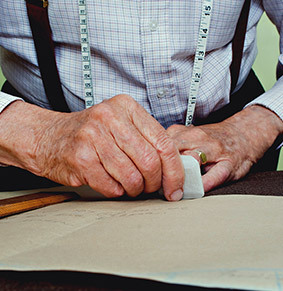 Unlike made-to-measure which uses a pre-existing pattern to outfit clients, bespoke garments are made entirely from scratch to your individual measurements and body specifications. Generally speaking, first-time client fittings will last about an hour to select fabrics, personalize designs and creating a fit profile. Repeat clients can typically select their garments and cater to any adjustments due to body weight fluctuations in about 30 minutes. How do I know my new clothes will fit? 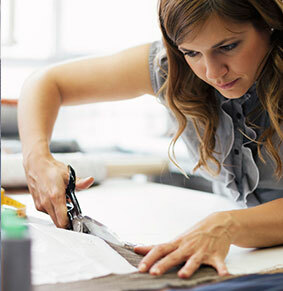 We stand behind every garment we produce and work alongside our clients until expectations are met. Since the custom garments are made entirely from scratch specifically for each customer, we cannot offer refunds. However, if expectations are not met we will either alter the garment or completely remake it free of charge. Our longstanding reputation for quality and customer service has kept us in business for nearly 30 years. Suits: After each wear, it’s recommended to hang your suit outside the closet overnight so that moisture can escape the fabric. Hang your trousers long-ways from the bottom hem with a pant hanger so as to naturally pull out wrinkles and reducing the need for pressing. Suits (and Blazers, Sport Coats, Overcoats, for that matter) should only be dry cleaned if they become physically dirty. While dry-cleaning itself (if done properly) won’t damage a garment, far too many cleaners use harmful chemicals to “clean” garments, which we don’t recommend utilizing. If your garment simply needs a refresh, it’s advised to use an iron delicately throughout the garment or have it hand-pressed by a reputable cleaner. Shirts: Shirts are recommended to be laundered every couple of wears, generally with warm water and then hand-pressed with a warm iron. Many cleaners outsource their laundering services – a practice we don’t believe in. Find a cleaner that launders their shirts in-house to prevent any damage that may be associated from outsourced commercial laundries. Further, we generally advise to stay away from starching shirts as that can cause cotton fibers to become frail and thus will wear out faster. Please bear in mind that some natural shrinkage will occur in new shirts, most typically around the collar/cuff. We have this shrinkage built into our garments and request that our clients provide a fit confirmation only after shirts have been laundered a few times. Simply fill out the Refer-A-Friend submission form and you’ll be on your way to earning a complimentary custom shirt on us. Once your friend has purchased any new garment, you will be entitled to a complimentary custom shirt value at up to $150. As an added bonus your referral will also receive 15% off their first order. It’s advised to wear your best fitting suit, shirt and pair of dress shoes to allow for precise measurements. Measuring clients in jeans and casual shirts is not recommended as these garments typically allow for a much more relaxed fit. Can you visit my office or conduct a group fitting? Yes! We often conduct group fittings and are the in-house personal tailor for several small corporations. However, minimum purchase amounts will apply and will vary city by city. For more information please e-mail us with a brief description of your request and we’ll reach out to you to coordinate a fitting. I don’t see a scheduled visit to my city, when will you be back next? Typically, we visit most major metropolitan cities a few times a year. If you don’t see your city scheduled on our Tour Schedule page, please drop us an e-mail to find out our next tentative tour dates will be. Please fill out our Gift Certificate Form . Once your payment information is verified your gift certificate will be issued. 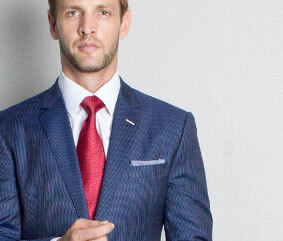 Can you have custom suits made for a wedding party? Absolutely! We’ve assisted several wedding parties in creating a custom (and affordable) solution for their wedding parties. We request that you provide us with at least a 3 month lead time so we can have each groomsmen measured in their respective city (or cities). We travel throughout the greater United States and visit most major metropolitan cities a few times a year thus allowing us to meet with each client in person. Do I have the option for my shirts to have fused or unfused collars and cuffs? Yes! Please be sure to request this with our tailors and we’ll ensure that your garments are specified to your preferences. Can my clothing be altered if I gain or lose weight? Generally, yes. If your body-type has changed drastically it’s only likely that the garments would be beyond the scope of allowance. We leave extra seam allowance so that our garments can be altered. Delivery times vary depending on the garment. 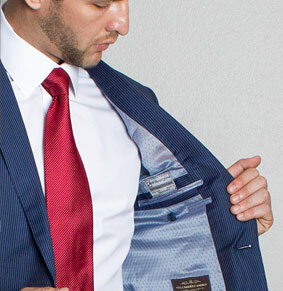 Generally speaking, suits take approximately 5-7 weeks and shirts 4 weeks after placing an order with us. Expedited orders can be accommodated at times, so long as we feel the quality of the final garment will not be compromised. Further, we prefer to have our new clients confirm their selections on an initial garment first before proceeding forward. First time clients are required to meet with us in-person for a custom fitting. This allows us create fit profile, understand client preferences, and, most importantly, for clients to better understand the overall process and feel fabrics in-person. 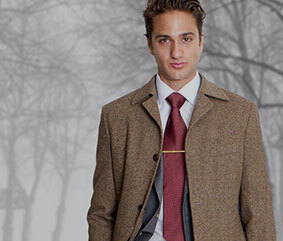 Our fit profile is quite encompassing to ensure a precise fit. Repeat clients may order custom garments by seeing us in-person or by requesting fabric swatch books. We believe in having our clients’ look and feel fabrics by hand rather than looking through pages of high-resolution images online, which would not allow clients to physically feel the beauty of a quality fabric. The price for any garments is completely determined by the fabric selected. We possess a full range of fabrics from world class mills such as the likes of Zegna, Loro Piana, Scabal, etc. For clients outside the California area who are not subject to California sales tax because their garments are being shipped directly to them, payment is due in full at the time the order is placed. We accept cash, check and all major credit credits. This gift certificate is valid only at M. Kenny’s Fashions. It may be redeemed by phone or in person. It is NOT redeemable for cash. Any unused balance will be stored as credit for future purchases to the recipient’s account.